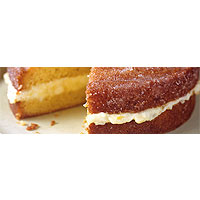 Our version of this classic cake is absolutely delicious - soft, buttery sponge, a creamy lemon filling and a crunchy sugary crust. Preheat the oven to 180°C, gas mark 4. Don't use the fan setting on your oven if you have one; it will dry out the sponge. Start by making lemon curd for the filling. Beat the egg yolks with the sugar using a wooden spoon in a small, heavy-based saucepan until smooth. Beat in the lemon juice, grated zest and butter, and heat for 3–4 minutes, stirring all the time until it thickens. You don't need to bother with a bain marie, as the sugar will stop the eggs from curdling. Once thick, allow to cool; cover and chill until needed. Grease a 20cm, round, spring-form cake tin and base-line with a disc of baking parchment. Place the sugar, softened butter and lemon zest in a mixing bowl and beat with a wooden spoon (if you have the muscles and the inclination) or an electric hand mixer (if you have one). The result should be pale in colour, with a really light and fluffy texture. Putting in the lemon zest when you cream the butter and sugar helps to release the oils in the zest, producing a much more lemony sponge. Now start adding the beaten egg, which should be at roughly the same temperature as the butter and sugar. Add it in stages, beating in after each addition. If it looks like it's going to curdle, add 1 tbsp flour. Finally, fold in the flour. You will be left with a really thick mixture, but this is what you want for a dense sponge, so don't feel you have to add any milk. Spoon the mixture into your prepared tin, getting every last drop out with the spatula, and bake for 35–45 minutes until it is shrinking away from the side. Test it with a skewer to see if the mixture is cooked in the centre; it should come out clean or with crumbs, not with any mixture. Remove from the oven and, if it is done, prick all over with a cocktail stick about 20 times. To make the sugar topping, stir the strained lemon juice into the sugar so it dissolves a bit, but not fully. Drizzle over the cake, slowly, waiting a few moments before adding more, so that it all sinks in. It should leave a crust on the cake as the juices sink in. Remove from the tin and transfer to a wire rack to cool. Using a serrated knife, slice in half horizontally, turning the cake not the knife to help you slice it straight. Set aside, and finish off the filling by placing the Mascarpone in a small bowl and swirling in the lemon curd. Lift off the top half of the cake and spread the base with the lemon curd and Mascarpone mixture. Replace the top half. Cover and leave at room temperature. If you want to keep it for longer than a few hours, wrap well and don't fill it with the Mascarpone until ready to serve.